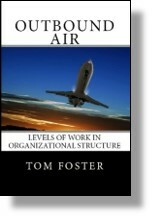 There are a number of management moves (Agile being one) that demands bottom up orientation. I say yes. There are other management moves that that demand top down. Yes. How to reconcile the inevitable conflict? The problem with those who would argue that top down is bad, they ignore the reason for higher levels of work and misconstrue the reason that management exists in the first place. Those who would argue against top down believe it is for control. It’s not. The reason for top down, is context, not control. It’s not about reporting. The fact is, we report to lots of people in the organization. I always ask, who has direct reports? All managers raise their hands. I have to deliver the bad news – you are not a manager so people can report to you. It’s not about control, it’s about context. Managerial roles exist to create context. That context is based on timespan. It is the role of the supervisor to think beyond what has to be done today, this week, this month. What is today’s work in the context of this week, this month? It is the role of the manager to think beyond what has to be done this quarter, this year. What is today’s work in the context of this quarter, this year? This entry was posted in Time Span and tagged accountability, bottom up, management context, management control, top down on February 15, 2019 by Tom Foster. There is term used in the vernacular of Agile that describes the challenge of every organization. It’s an acronym for the world in which we live. Volatile, uncertain, complex and ambiguous. VUCA. Without any further definition, Agile offers many good ideas in dealing with that world. Acknowledging that we live in this VUCA world, can we do more than spitball solutions? And, that is where Timespan comes in. Most people clearly understand there are some problems more complex than others, some decisions more complex than others. There are different levels of VUCA. Timespan gives us insight into those levels. When the Deepwater Horizon blew up in 2010, the world looked, aghast, at a terrible environmental accident. I watched the coverage, the cameras on the ocean floor in real time and the engineers struggling with the problem. They tried this, they tried that. They tried the blowout preventer, that didn’t work. They tried the blind shear ram, that didn’t work. They were in a mode of trial and error problem solving. Why? Our understanding of timespan gives us insight in the levels of VUCA, and the level of problem solving required to make sure Deepwater Horizon doesn’t happen again. This entry was posted in Levels of Work, Time Span and tagged Deepwater Horizon, levels of work, timespan on February 8, 2019 by Tom Foster. Let’s say I buy this stuff about levels of work. What will it help me do as a manager? What results should I see? Immediately, as a manager, understanding levels of work will assist you in figuring out what you can delegate and what you have to self perform. As you look at task assignments, understanding levels of work will help you understand who to delegate work to. Here is the immediate impact, you can make sure there is enough challenge in the work for your team to feel engaged at the highest level, stretched to their maximum capability. When people find challenge in their work, using their full attention and competence, what happens to job satisfaction? There is no managerial trick. As a manager, you do not have to become a motivational speaker. It’s all about the work. Match the level of work in the role with the capability of the person. Maybe it is a little like magic. This entry was posted in Levels of Work, Time Span and tagged delegation, motivation on February 6, 2019 by Tom Foster.